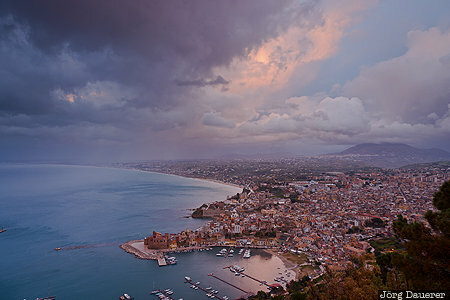 A colorful sunset sky above Castellammare Del Golfo and the Mediterranean sea. Castellammare Del Golfo is in the province of Trapani in the west of the Mediterranean island of Sicily, Italy. This photo was taken in the evening of a rainy day in April of 2017. This photo is in the Photo Calendar "Sizilien". This photo was taken with a digital camera.